Hello everyone! 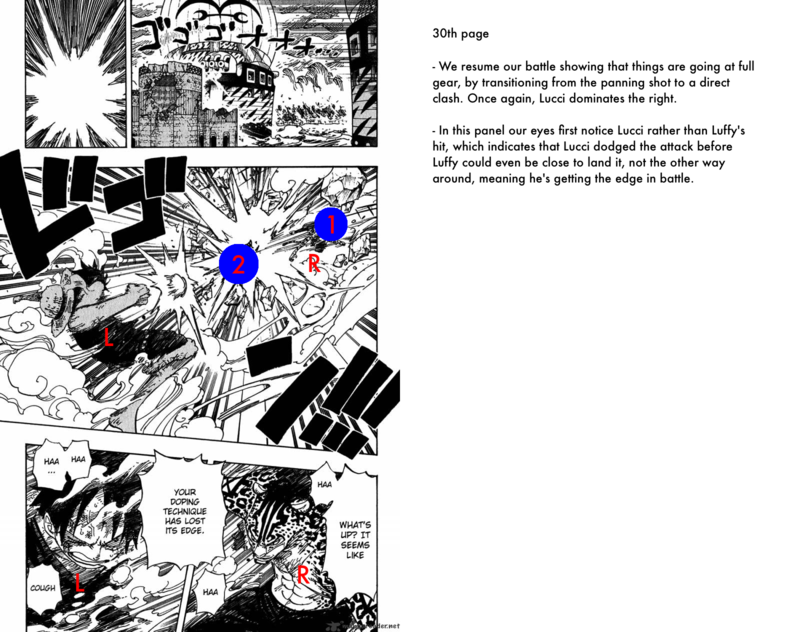 This morning I read a beautiful post by /u/potentialPizza about Oda’s clever use of panels, it’s a fantastic read. 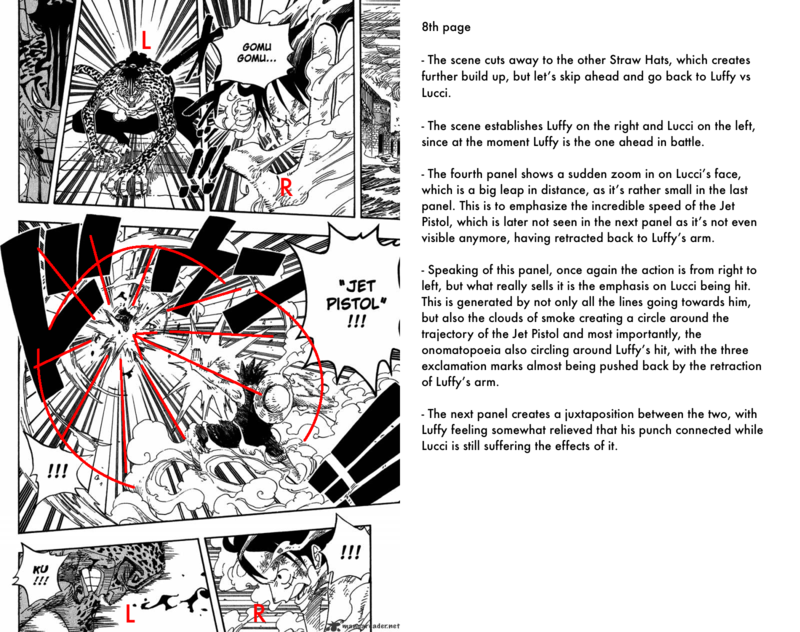 This is an aspect of One Piece I’ve always loved and I do agree that it usually doesn’t get as much appreciation as it should. 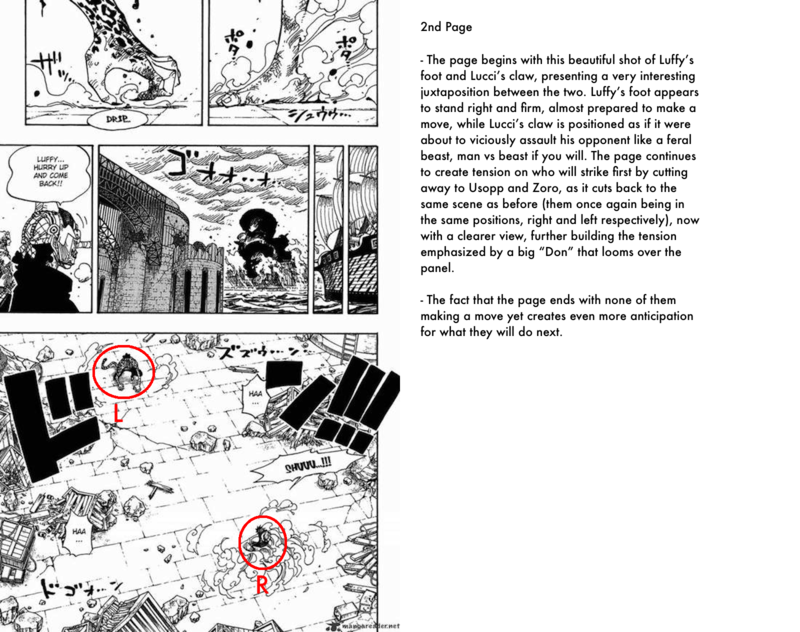 But I wanted to point out that this isn’t something that Oda developed only recently, but something he’s always excelled at. 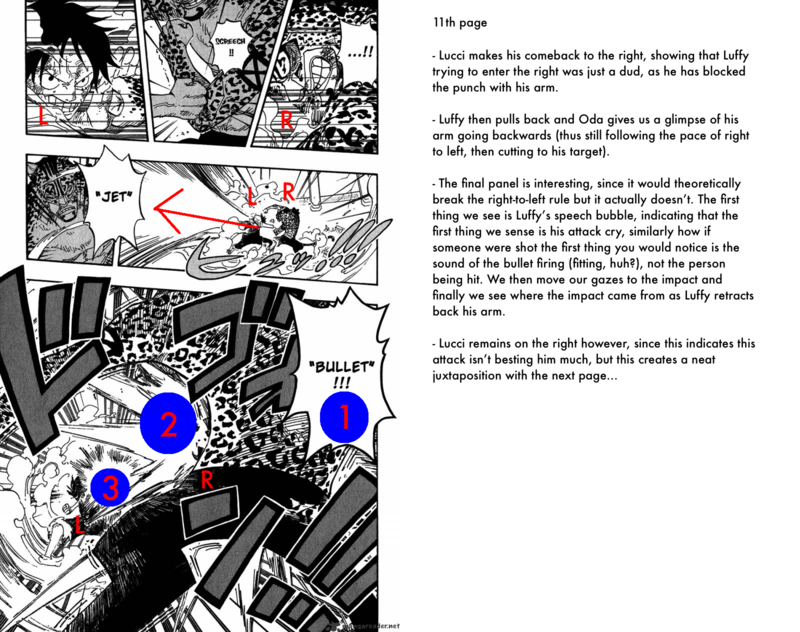 A lot of people like to say that “One Piece got better over time” and once was only “good” and while in certain technical aspects it did, in my opinion it always was a masterpiece from the very start and things like these are things Oda has always applied. 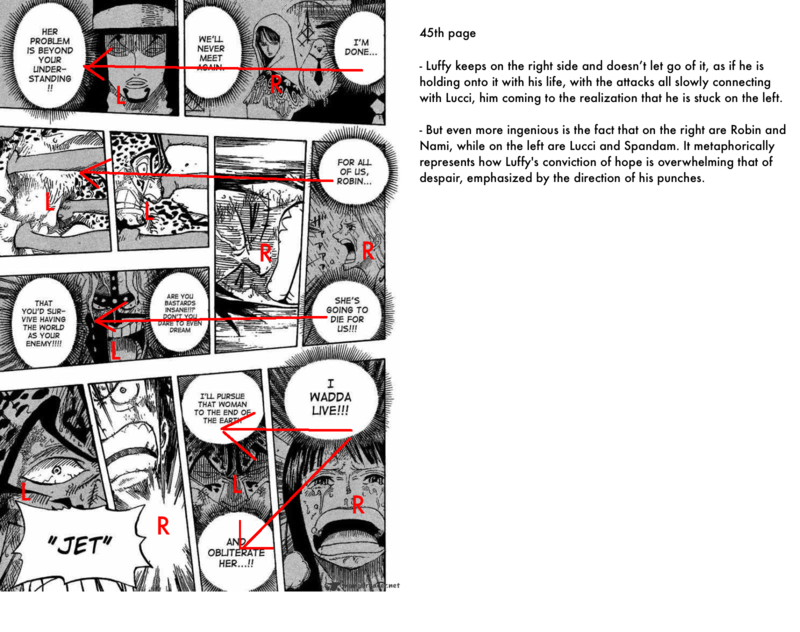 Before we go onto anything I should mention two fundamental rules Oda uses in his way of drawing. The first is the rule of progression, or the right-to-left rule. 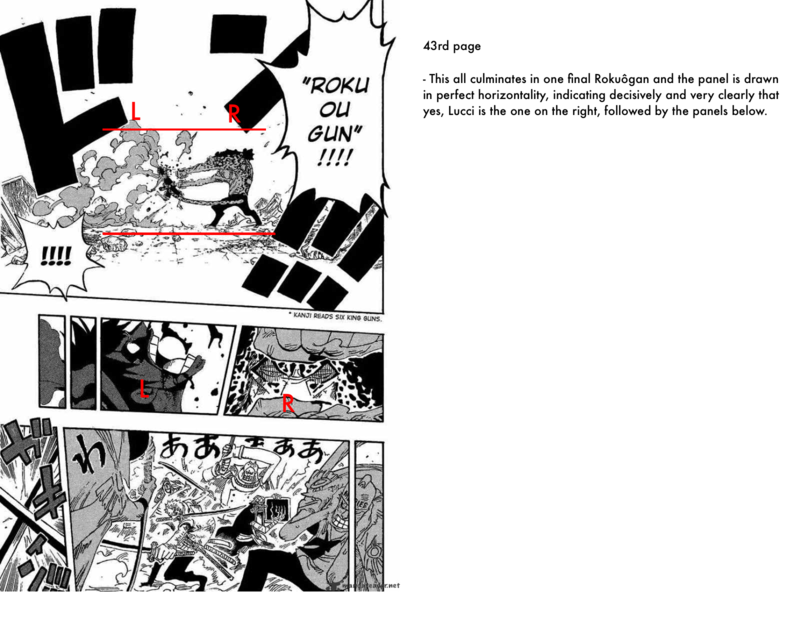 This rule is based on the fact that readers read manga from right to left, which means that the action must progress from right to left. 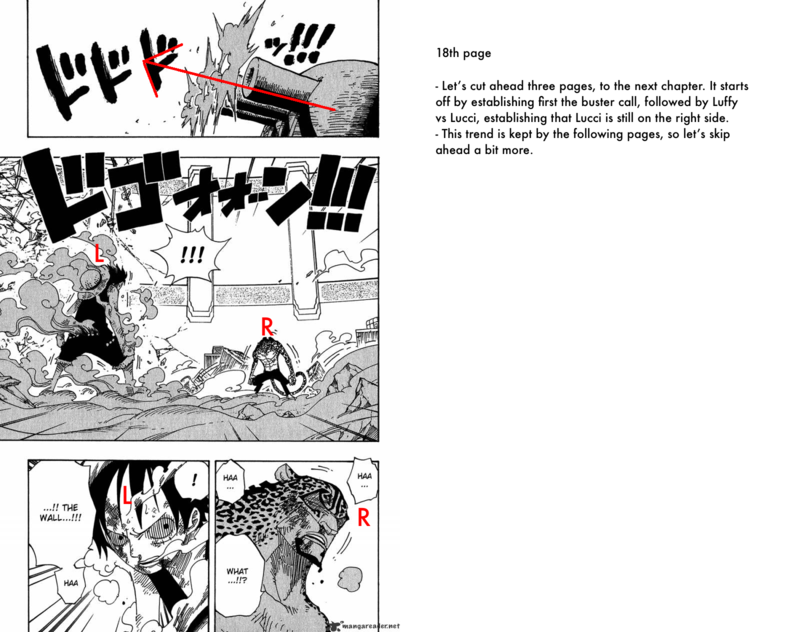 If someone is punching, the punch should be coming from the right side towards the left, allowing the reader’s gaze to follow it from it’s beginning to it’s impact. This applies to sound effects, dialogues and other movements as well. The second rule is the 180 degree rule, a well-established rule in cinema that states that when displaying a fight or an established shot with two people, it’s important to have explained who is on each side, having someone on the right and someone on the left, never allowing the camera to go beyond 180 degrees and changing the perspective, as that would confuse the watcher/reader. The perspective can change, but only if it’s relevant and dynamic, or if transitioned well. 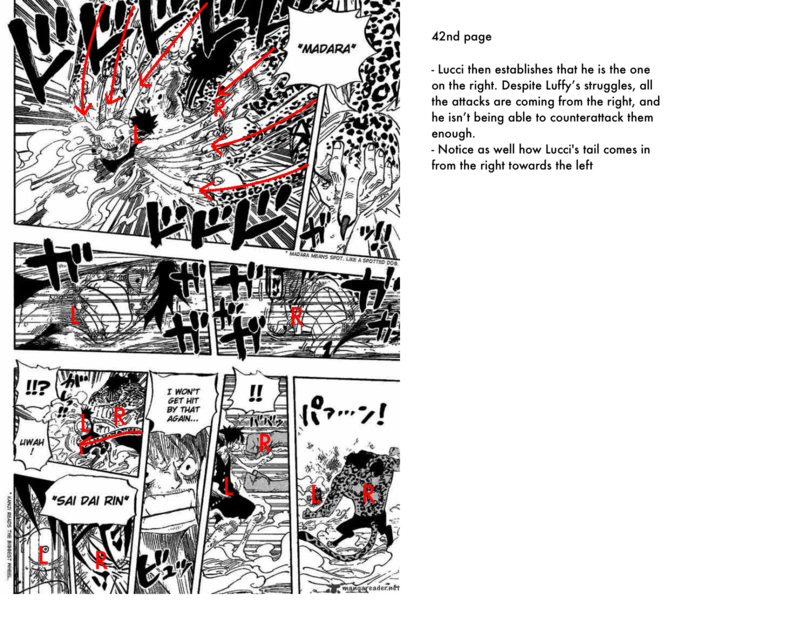 So with that out of the way, I decided to pull randomly one of the classic fights in One Piece and show how Oda’s technique applies to the the entirety of the series. 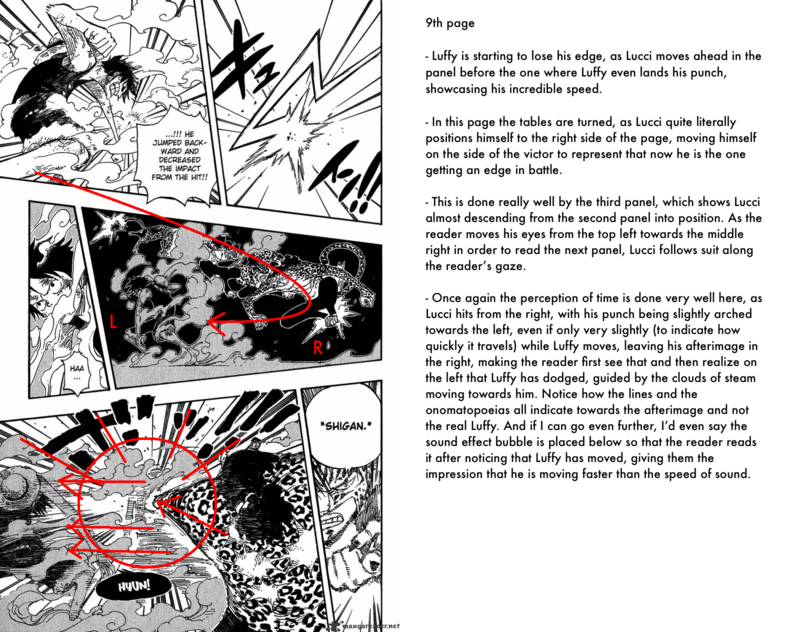 The fight in question, Luffy vs Lucci, specifically the concluding parts. 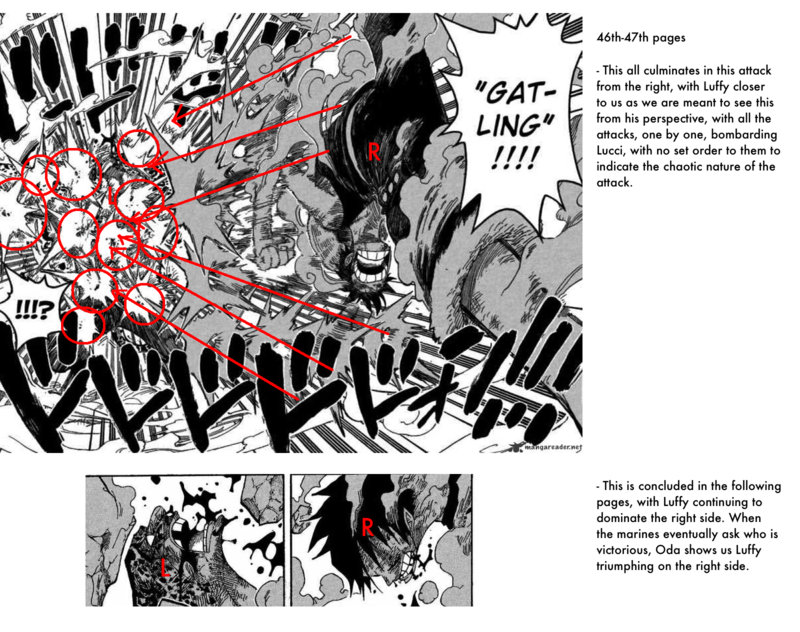 This is one of the reasons why I can’t stand people that dismiss types of art like manga and comics claiming that they don’t have the level of detail and effort of written works. 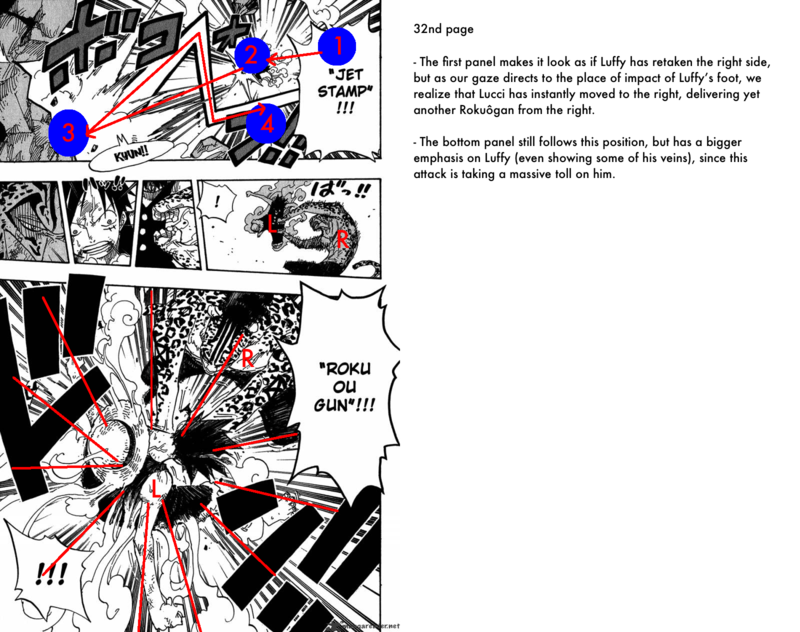 In the same way that a poet carefully chooses his syllables, a mangaka carefully places his panels, something that requires a lot more skill than what may appear at first simply translating a story into a visual format. 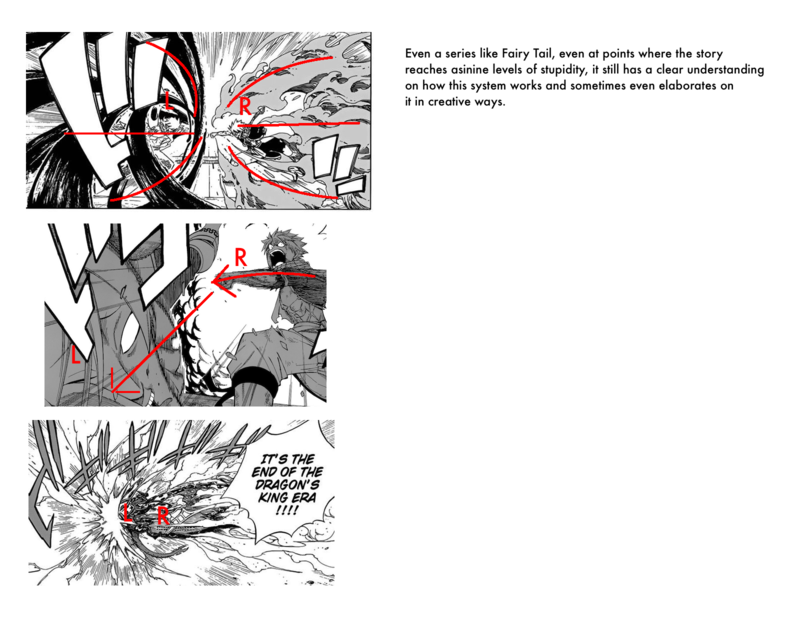 But of course, even if the majority of all manga follow this, very few truly master it. 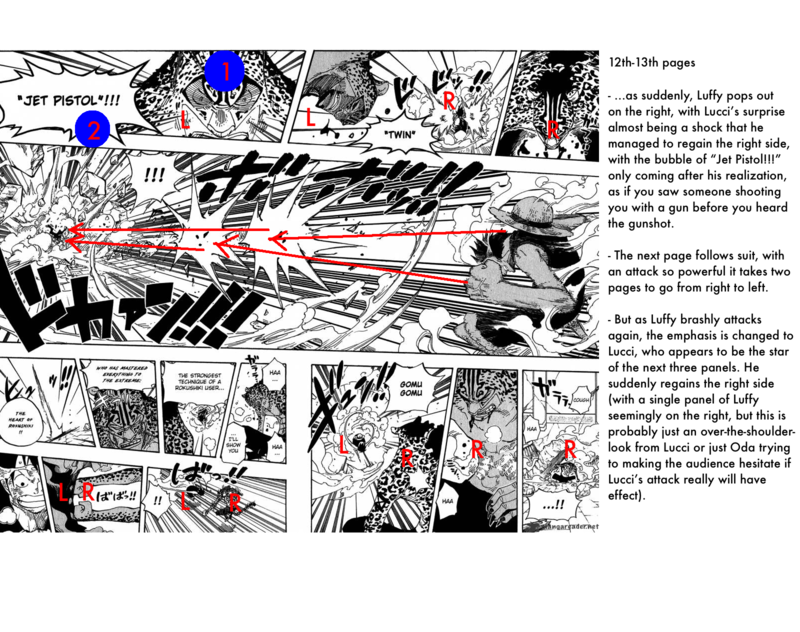 And of course among them all stands One Piece, which I believe is the supreme example of how ingeniously this can be done, though other mangas can as well provide different styles and different takes that are interesting in their own rights. 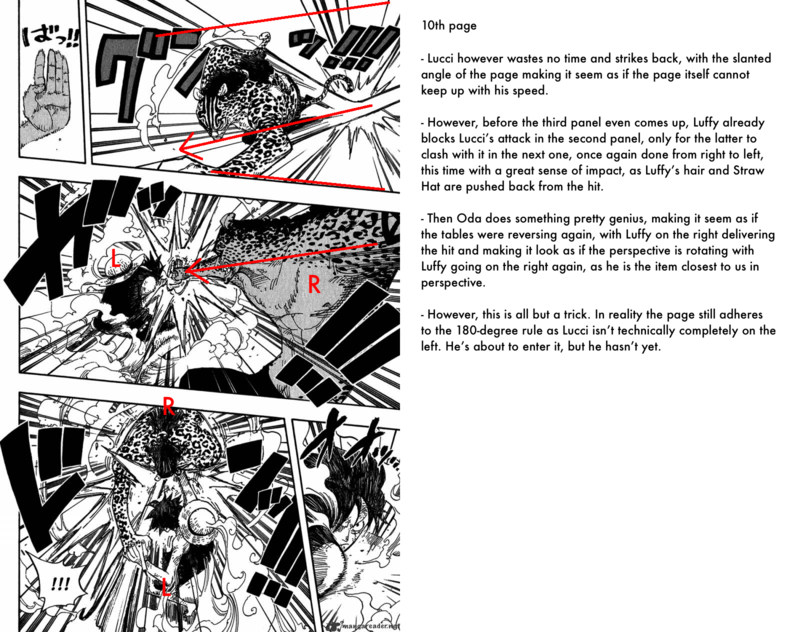 Unlike the example provided by /u/potentialPizza where Katakuri is overwhelming Luffy, here the perspective continuously changes, shifting from Luffy to Lucci back and forth. 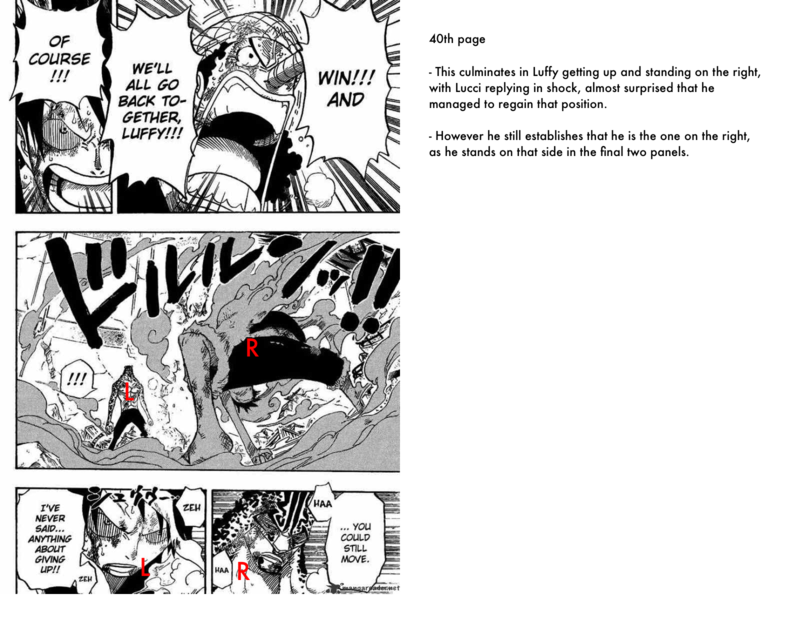 At one point it seems that Luffy has the advantage but Lucci easily retakes the right side, only for Luffy to quickly regain it and so on ans so forth. 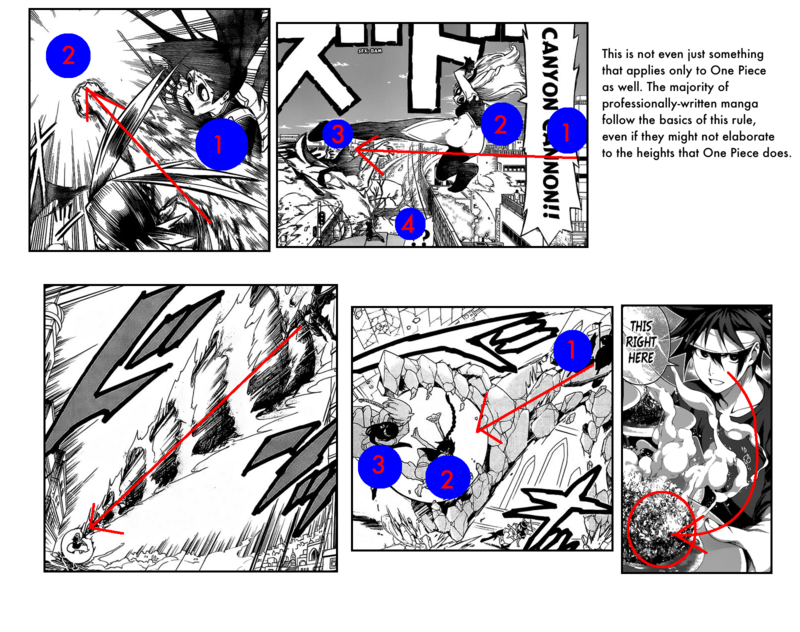 It’s a continuous exchange that shows just how close the battle was, with a complete understanding on how to handle paneling in manga. 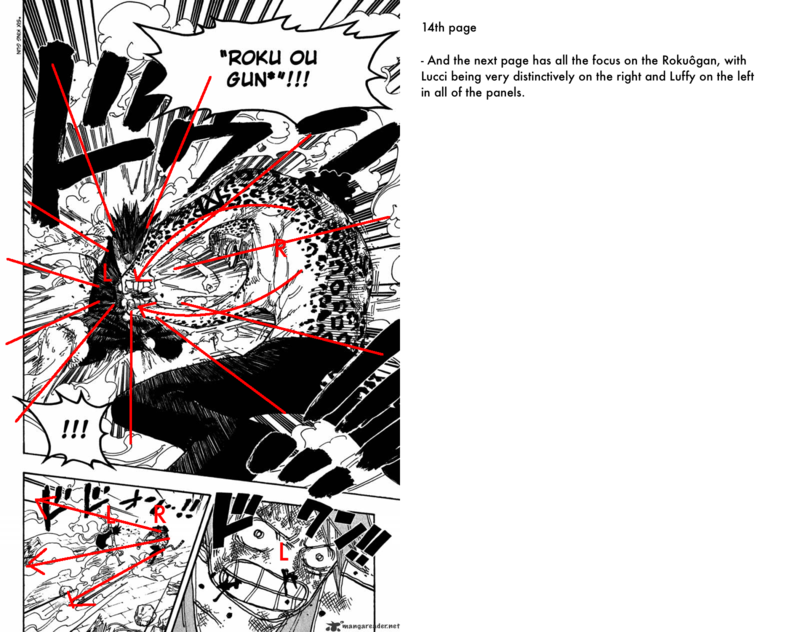 I hope that with this I showed a little of the attention that Oda puts down on each page of manga he creates. 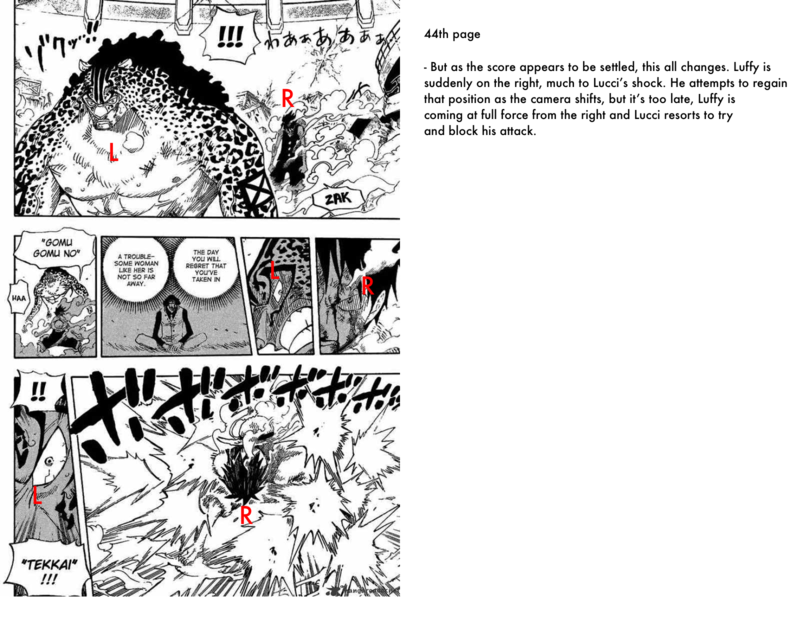 The incredible thing about his art is not just all the details he peppers throughout the chapters, but even the way it’s technically displayed as well. All of that said, I’m super glad that there are people like you who take the time and effort to enlighten those of us who tend to be more oblivious than not. 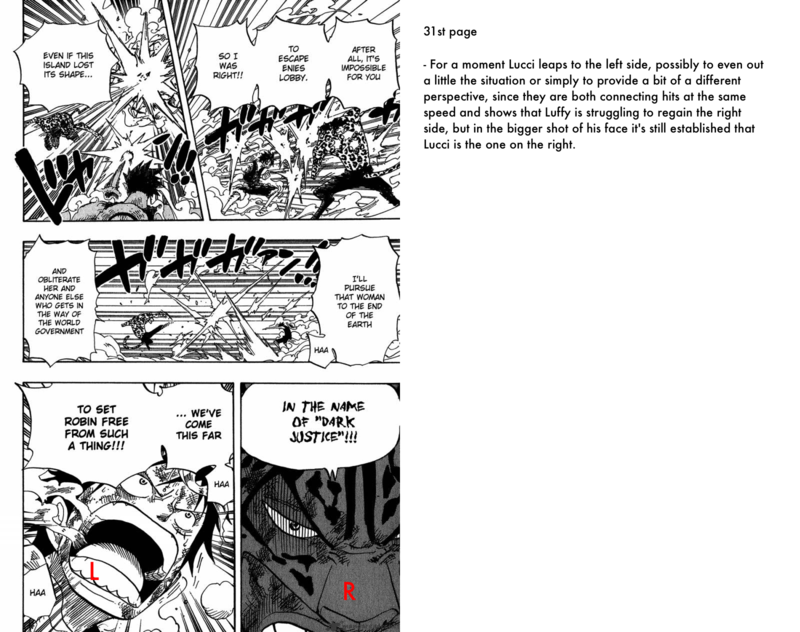 How come the ship here has divided into tall vertical panels on the right-side of the page, when the entire picture could easily condensed into one background? What are those two vertical panels emphasizing? Ah yes, the classic two vertical Oda panels. 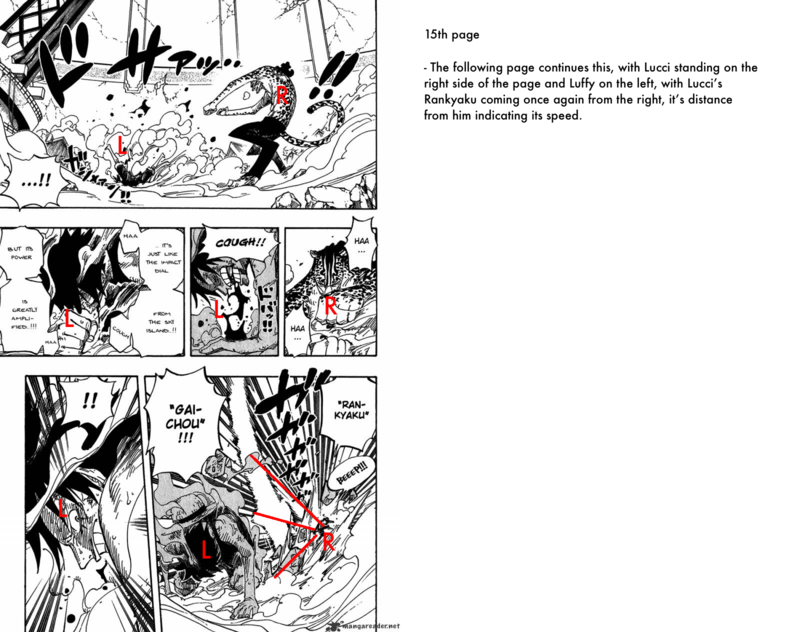 It’s a technique Oda has used throughout the entire manga, it’s a very clear indication of a change in location. It indicates that the action is shifting from one place to another. 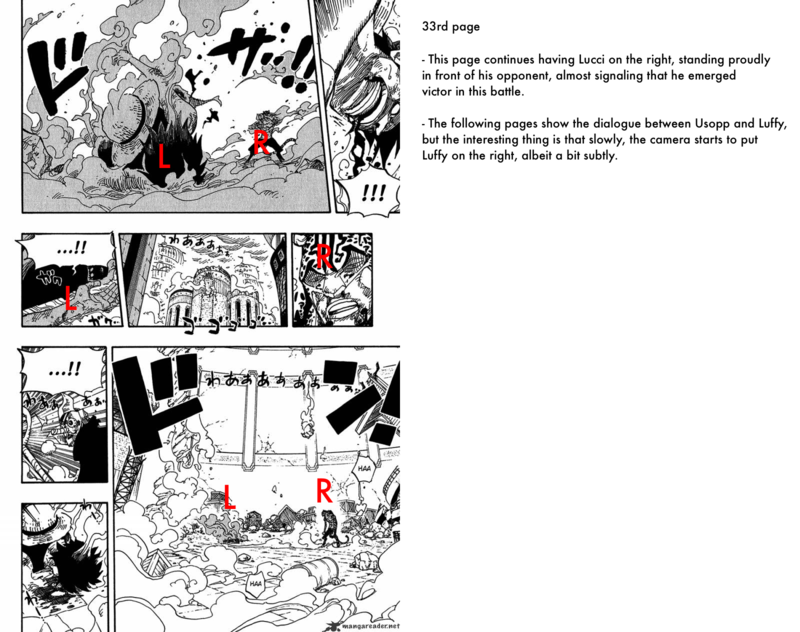 In the same way that in a movie a camera could slowly pan to show you a larger scene, Oda gives you a few panels before you see where the location has changed. 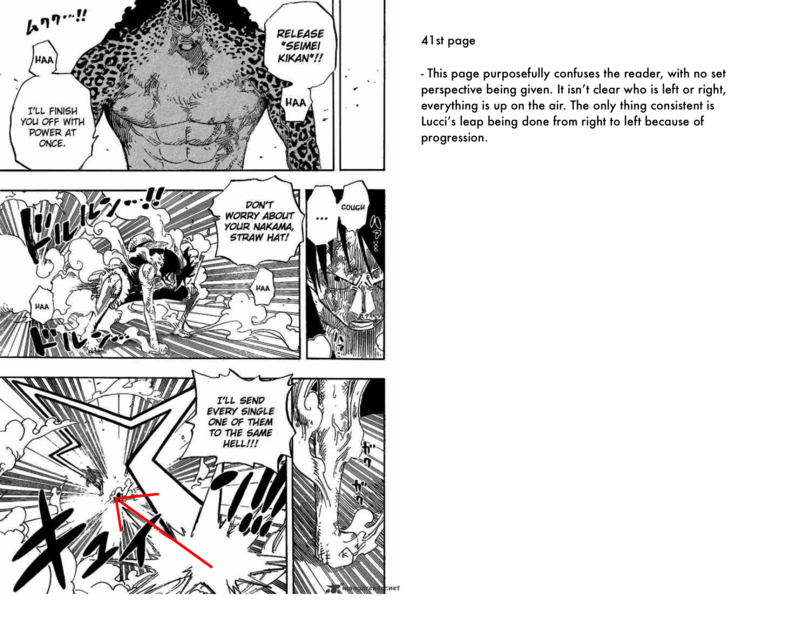 If you ever see those panels being used somewhere in the manga, it means that we are in a different location than before! 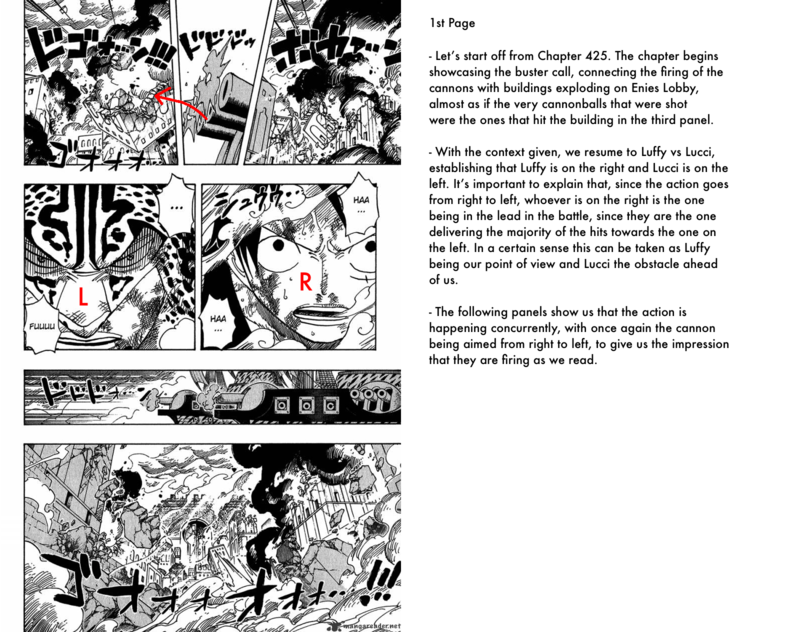 You can even spot them in last week’s chapter if you look closely! So does it also indicate a change in time? My friends pointed that out when I showed them the same panel.